This tutorial covers basic App Inventor Bluetooth communications code. 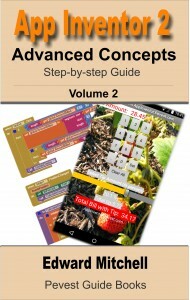 Subsequent tutorials will add additional features. To implement and test this sample code, you need access to two Android devices – one to act as a Bluetooth “server” and the other to act as a “Bluetooth” client. I tested this code using an old LG smart phone running Android 2.2 and a new Nexus 5 running Android 5.0.1. I also tested this code using the Nexus 5 paired with a Nexus 7 tablet. This tutorial is lengthy – it introduces Bluetooth communications, then presents the user interface and blocks code for both the server and client programs, and then discusses how to set up the Bluetooth Communications link using “pairing”. Downloadable App Inventor source code for the client and server is at the end of this post. This is the first of several posts on Bluetooth. This first post covers basic connections and the sending and receiving of text between two Bluetooth devices. The two halves of the link – client and server – are kept in separate apps to keep this simple, however, it is possible for a single app to act as both a client and a server. A subsequent post will show how to send other types of data, such as numbers, and introduce additional features for using Bluetooth communications. Bluetooth is the communications technology with a funny name. Bluetooth is actually named for a long ago Danish king who worked to unite groups of people, which is similar to Bluetooth’s goal of interconnecting different devices. The King’s real name was “Harald” but he had a nickname that translates as “Bluetooth” – no one knows for sure why he had this nickname but one thought is he had one dark tooth that may have appeared black or blue. And that is certainly an obscure way to choose a name for new technologies! Bluetooth establishes a very low power, short range (up to 10 meters) communications link between two devices. Bluetooth uses the same frequency band (2.4 Ghz) as Wi-Fi, but uses different technology. Both Bluetooth and Wi-Fi use forms of spread spectrum radio links that result in signals moving around within a wide band in ways that enable sharing of the spectrum by multiple devices. But the two technologies serve different purposes, are not identical, and cannot communicate with one another. Bluetooth applications include common wireless headsets for wired and cellular phones, and in-ear cordless adapters for phones. Bluetooth is also used by cordless headphones and to exchange address cards between devices, and for industrial applications where sensors collect and send data into a network. There are two forms of Bluetooth – classic Bluetooth, which we use in the sample applications, and a newer version known as Bluetooth low energy, Bluetooth BLE, Bluetooth LE or Bluetooth Smart – all referring to the same new technology. The newest Android devices running Android 4.3 or newer, usually support the newest Bluetooth Smart technology. Regardless, we use classic Bluetooth which is backwards compatible to older phones, and is the technology supported by App Inventor. Setting up a Bluetooth devices involves “pairing” the two devices and establishing a connection. This will be covered later in this tutorial. There are two separate apps for Bluetooth communications – one is a “server” app that runs on one device, and the other is a “client” app that runs on a second device. The server must be run first on one device and then the client app on the 2nd device connects to the server before data can be sent between the two devices. More on this later in this tutorial. Accept Connection Button – press this to set the server to accept a connection from another device. Connections are not possible until the AcceptConnection service is started. Send the following text Button – the text is the following text box is sent to the other Bluetooth device. Non-visible components – The apps use a clock to cause activities to occur at a preset interval. The Notifier1 component is used to display error messages (see tutorial on the use of Notifier), and BluetoothServer1 provides the Bluetooth support. The BluetoothClient1 and BluetoothServer1 components are located in the Connectivity section of the Designer palette. How each of the buttons and components are used to run the program are explained later, in a section on setting up Bluetooth on your devices and running the apps. The user interface is similar to the server except instead of AcceptConnection there is a Connect to device button, and instead of a BluetoothServer1 component, the BluetoothClient1 components is used. The Connect to device button is actually a ListPicker component and not a standard button. For both the client and server apps, the TimerInterval of the Clock properties is set to 1000 milliseconds or 1 second. Other small values may also be used. This value determines how frequently to check the Bluetooth link for incoming data from the other device. As shown, each app will check the link once per second. We start with the server app implementation. The client app is presented after the server app. The first step is to check that Bluetooth is activated or switched on. If not, an error message is displayed reminding the user to open Android’s Settings and then switch Bluetooth to on. The Initialize event occurs when the app is launched – and this is a good place to check whether or not Bluetooth is enabled on the device. Assuming that Bluetooth on the device is currently “on”, the next step is to accept a connection from another device when the btnAcceptConnection button has been pressed. This causes Bluetooth to begin listening for an incoming connection. Once a connection request has been received and processed, a ConnectionAccepted event occurs. In our basic app, we update the status message on the app screen. Receiving data sent over Bluetooth takes place in the Clock1.Timer event handler. Remember, the clock is set so that the Timer event happens once per second. Every second, the app will check if any data has been received. To prevent reading data when Bluetooth is not connected (this would cause an error), an if-then statement checks the IsConnected property of BluetoothServer1. This value is set to true when the devices are connected and false if the connection is not currently available. IsConnected should be true if a connection has been accepted. But because this is a wireless connection, a device might go out of range or be turned off, breaking the connection. It is good programming practice to check that the connection is working before trying to send or receive data. The property BytesAvailableToReceive tells us how much data is available (one text character is equal to one “byte” of data). If this value is zero, then no data is available. But if the value is greater than zero, then our app may read the incoming data and update the status and messages to the app display. 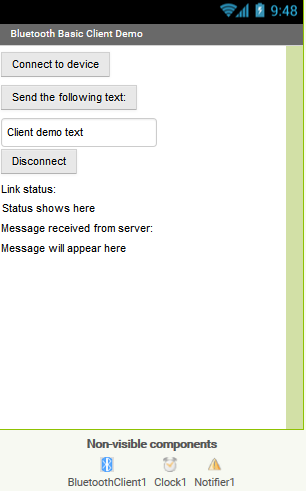 The Send Text button event handler is similar to the receive code located inside the Timer event except that data is sent using the SendText method to transmit the data to the other device. The Disconnect button handler is self explanatory! One thing to know about wireless communications is that errors happen. For most of our App Inventor apps, we ignore potential errors – if errors occur, the app stops running and Android displays an error messages. Rather than letting that occur, our app can intercept the error condition by adding an error event handler to the main screen, Screen1. The ErrorOccurred event has four parameter values (local variables) that contain information about the error. 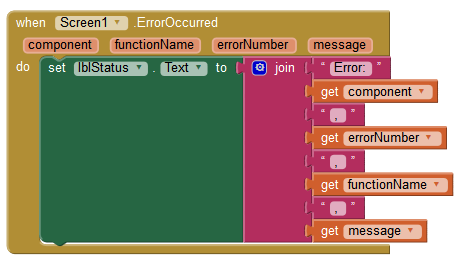 The error handler displays the error values on the screen, rather than shutting down the app. Now that the server app is complete, we present the client app that runs on the other device. In many ways, the client app is a mirror image of the server, but refers to the BlutoothClient1 component instead of the BluetoothServer1 component. Same as the server, except it uses BluetoothClient1. Before the list is displayed, the list is filled with the list of Bluetooth devices (AddressesAndNames). The set lblStatus.Text block may be deleted as it was used during my testing and is not needed in the final version of the client. After the device has been selected with the ListPicker user interface, the Connect method of BluetoothClient1 establishes the connection. 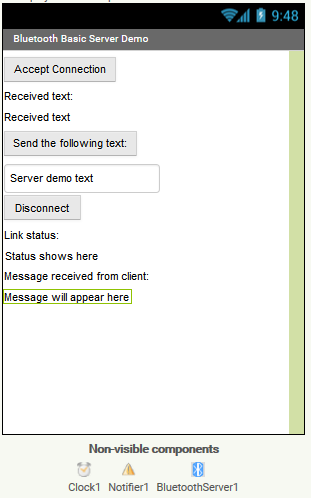 The method returns a value of true if the connection was successful; in which case a message is sent to the server app. Like with the server, the reception of data is implemented using a timer. Once per second, the client checks to see if data is available, and if it is, reads and displays the data on the app display. While the server must be running prior to the client making a connection, once the two devices are connected, either app can send data to the other app, at any time. The client’s error handling is identical to the server’s error handling. Use Build .apk or other method to obtain the server app, download and install on your first Android device. Use Build .apk or other method to obtain the client app, download and install on your second Android device. Go in to the Android Settings and turn on the Bluetooth feature. The user interface for the Bluetooth configuration varies slightly depending on which version of Android you have. On 2.2, for example, you need to select Wireless & Networks, and then choose Bluetooth, while on Android 5.0, Bluetooth appears in the topmost Settings menu. In newer versions of Android, when the Bluetooth Settings menu is active, your device is broadcasting its availability to other nearby devices. On older versions, you may need to click an option to make your device “discoverable”. (Note – my Nexus 5 is not visible on my very old LG 2.2 device – however, the Nexus 5 sees the LG and the two can be connected from the Nexus 5 side). Once your two devices see each other over Bluetooth, you may be prompted to “pair” the devices, or (depending on Android version), you may have to manually choose the device and then choose pairing. Follow the on screen instructions. Once the two devices are “paired”, launch the Server app and select Accept Connection. On the other device, launch the Client app and select Connect. If all goes well, you should see a “client connected” message on the Server app. More features in future tutorials! Previous PostMIT App Inventor – now available with Chinese or Spanish InterfaceNext PostPevest App Inventor web site now features Google Translate: Translate into many languages! Gary Chung liked this on Facebook. Hey! Really helpful tutorial… I’m creating this new app that requires PvP feature.. I hope that I can use this as reference for my app ! Your contributions will be very much acknowledged! 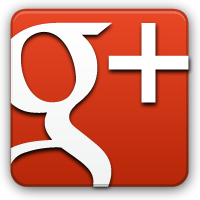 Your are most welcome – I appreciate hearing that these tutorials are helpful! Thanks for the feedback! I am getting an error anytime I try to send data as a list “could not decode element 1 as integer” I try to send bytes as list text and number from database what am I doing wrong. 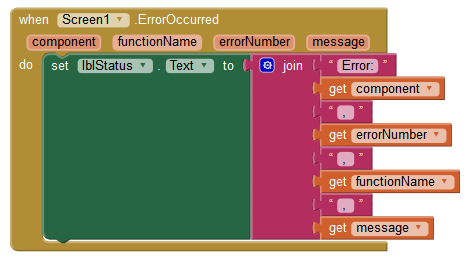 We’d need to see the blocks code – sounds like a programming error that is fixable. Am guessing that the item you are trying to convert to an integer is an actual list element. There are several ways to force the conversion. You might try a define global or local variable that is first assigned an integer value like 0. Then let that variable get the value of the list element. It should convert it to an integer there. May I use the .aia from this website? I realize this question is old – but YES! The source code here is intended to illustrate how to do things – no guarantees as it is not done as rigorously as done for a commercial product! But I post the code here for anyone to use in their projects! Sure. That’s why they are available! But no guarantees, make sure you test in you own app! Haven’t seen that one before. What type of phone or tablet are you using? That is interesting. If you were to call the Bluetooth disconnect block before the listpicker, does that still happen? I would like to know how to receive and compare numbers using app inventor 2 programing. I am using an arduino with a bluetooth shield. It is possible – but I have not yet implemented Arduino–>Bluetooth–>Android App Inventor – so I cannot help you right now but perhaps someone else can. 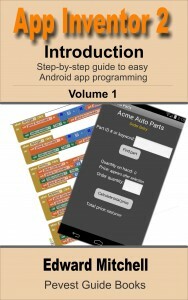 will work to talk to an Android App Inventor app. However, some of the Bluetooth shields are Bluetooth LE (low energy) which is a newer standard that is part of Bluetooth. It provides for low power/long battery life for applications in health care, sensor networks (like security or environmental sensing). Bluetooth LE also requires support in your device (my Nexus 5 has both traditional Bluetooth and Bluetooth LE). But App Inventor does not support the Bluetooth LE mode so we cannot yet write apps directly in App Inventor that communicate with a Bluetooth LE device. I have BLE cards from redbearlab (http://redbearlab.com/bleshield/). Is this card usable to this app inventor technique ? I have a different Bluetooth LE card – and I have it talking between the Arduino and an Android app supplied by the vendor, running on my Nexus 5 smart phone. But that is not an App Inventor app. My recollection from going through the App Inventor source code itself is that App Inventor does not work with the low energy version of Bluetooth. That said, many Bluetooth devices support both the newer LE standard and also the original Bluetooth standard (e.g. Bluetooth 2.1 and upwards). Without knowing the specifics of that board, you might give it a try and see first if your Android phone device can see the BLE card (probably can), and then write some App Inventor code to see if it can just make a connection. I need to create a Multiple bluetooth connections to multiple devices to implement a “chat room”. I don’t know what i do. I read and undestand your article about Bluetooth communications between 2 devices, but i don’t know how to make it between three or four or five, ect device. Could you help me? Bluetooth only pairs 2 devices. I’m waiting for an airplane flight and can’t lookup anymore right at the moment. This tutorial saved my project. Glad I could help! Thank you very much for letting me know! Hey there, im trying to build an attendance system using bluetooth, i would like to know, how to restrict the server to accept connections ,only from specified mac addresses and also how to link server to a database to store the attendance . Muchas gracias hermano, me fue de suma utilidad para una aplicación que estoy realizando, aun me faltan las pruebas finales claro. Hey i tried to access the bluetooth project and test on it but i have a problem everytime i hit accept connection or connect device it freezes. anyway i can select the bluetooth to pair with the bluetooth module from the program? A lot of people have this working okay. What type of phone(s) are you using? For example, I can get my Android 5 Nexus 5 to talk to an old LG Android 2.2 phone, but I have to jump through hurdles to make it work because of changes in Bluetooth support between those versions. i made blutooth chat app. when i click listpicker it opens and always shows blank screen. it can’t display BT device name. please tell me what is the mistake is going on? It should show the list of known bluetooth devices. Have you “paired” the bluetooth device before running the program? For some unknown reason, it seems the App Inventor’s call to get the list of BT devices is returning no devices. Did you ever resolve this? Another basic item to check is that Bluetooth is turned on in Android Settings. do you know if there is away to link to a bluetooth headset. I want to use the button on the headset to work as a click event in my program? also your site is good and helpful. I am tempted to make a site with some guides my self. This might be possible but would be very complex. App Inventor supports some Bluetooth communications (but not the newer “LE” low energy type) and can likely link to a BT headset. Once the link is established, compatible devices communicate with a “protocol” over the link. For those not familiar with protocols, think of this as defining who talks first on the link and what are appropriate replies and had the data back and forth is formulated. Is it possible for an App Inventor program to implement the protocol to a BT headset? Possibly. There are a lot of protocols, for different applications, defined for Bluetooth. You can see a nice summary at Wikipedia https://en.wikipedia.org/wiki/List_of_Bluetooth_protocols. I am guessing that the synchronous communications-oriented link is the one that headsets use. The next step would be to search online to see how that protocol is defined and to see if the BT headset and AI code can actually see bits going back and forth. Thank you this has pointed me in the right direction. I didn’t know about this. What if we implement in the same screen? I think you are asking – could the server and client apps, which I created as 2 separate apps, be combined into one app? Yes, they could. They do not have to be in separate apps. I kept them separate so that the concept of the client and server could be explained in a simple example – combining them into a single app would make the example a little more complicated. Is it possible to have the server accept connections from more than one device at a time? Trying to design an attendance app where a lecturer can send out a bluetooth signal and present students can connect and send back their student numbers to be marked as having attended. 1. Drag a Bluetooth component (such as the BTServer) into the Designer window. 2. Drag a second Bluetooth Bluetooth component (another BTServer) into the Designer window. 3. Implement the connection and receive code for both BTServer components – one will be named BluetoothServer1 and the other will be BluetoothServer2. 4. Now, get two more Android phones and implement the Client code and see if you can set up two connections – one going to Server1 and the other going to Server2. For now, duplicating the code for each Bluetooth channel is going to be the simplest to explain. However, there is a way to write one set of code that can maybe handle both servers – but that would need a whole tutorial on another programming concept before we even get to the Bluetooth part. If you try this, let us know how this work? This could be a great tutorial opportunity for the blog! Hi Ed.This really worked and done a trick..Awsome man!!! I have been working on it as a part of my project and done it.. I am sorry to disturb..but I have a doubt..is it possible to have many bluetoothclient to be used in client application? ?I think it works but still i didnot try it out..
You set up the multiple Bluetooth components? If that works, let us know! 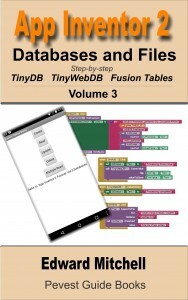 And if you wish to share sample code, I could post it here to help others – if this all works! Yeah sure Ed..but how to share and can I have multiple client? ?I tried it but didnot work..
Ed..can you please help me to display the history of received tetxs in that app? ?I am using currently file component and im trying it..not sure if it will give me proper result.. The Bluetooth app that I have does not keep a history of text received. That could be added by putting code in the Timer event handler – where the message is read. There, add the incoming message to a list. Also, another thought – it just so happens that I am a volunteer engineering mentor for a FIRST Robotics team (#4488). One of the students is implementing an attendance app in App Inventor. Each student has a Team #4488 ID card they are supposed to have with them during each robotics meeting and event. On the card we are printing a QR Code with the student’s ID#. The attendance app does a QR code scan of the student IDs. This does, of course, require the students to sequentially walk by the Nexus 7 tablet we have out at the beginning of meetings. I imagine we will be making this code public, once its ready, as our team tries to help out other robotics teams as much as possible. Even if you are not doing robots, you’d be welcome to the code! Perfect thanks for the info. Yes I’ll try adding the coding for QR Code scanning as another option. So my app will have both Bluetooth Option for recording attendance and a QR Code scanning option. Thanks for the help, looking forward to seeing the code for what ye finish with and seeing if I can return any help to ye. Sorry to be bothering you again. Just a thought, do you think its possible to have the app export all the text received to the BluetoothServer as a list, and then using the share function, email it to a specified email address. Currently testing your idea of dragging in multiple bluetooth servers to allow multiple connections. Yes, you can certainly save the output to a text file stored on the device, and then transfer that file to email or another device using various methods. I used a free app from the Google Play store called File Manager. I navigated to the text file I created, selected the file (by placing a checkmark to the right of the file) and then sent via email. Thus, your ideas should work out fine. Yeah Ed.,I got it …and regarding multiple bluetooth connection you have to add to the accept connection method 7or less servers and that works…Thank you again man!!!! Classic Bluetooth can support one “master” device paired with up to 7 additional devices. Bluetooth LE (low energy) is a newer kind of Bluetooth (but not backwards compatible with older devices). Bluetooth LE does not have a specific limit on the # of devices that can be connected. Based on my past experiments and looking at the MIT App Inventor source code directly, App Inventor works with the “classic” form of Bluetooth and not LE. That is probably a limitation of the iPod / iPhone / iOS software, or the app running on iOS. They may not have envisioned that someone would want to connect one device to multiple speakers – and chose not to implement that feature. From the comments on this page, it seems there would be a lot of interest in getting multiple bluetooth links working from one Android device. 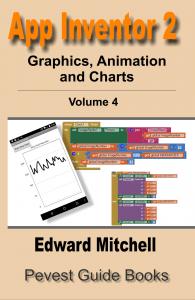 Hi Ed.I have published my bluetooth free chat app on app inventor gallery so you can find the codes there.Thank you Ed.,I think may be it helps you.. I was wondering if any of ye might be able to help me out. Seeing as I know when I replicated the code for just 2 client devices and there was no error that data transmission was possible and genereal bluetooth capabilities allow up to 7 clients, I was wondering could ye help me or give me an an opinion with the error. Is this coming up because not all 7 bluetooth servers have a client connected? I can still receive data as I have another label to show the text received via bluetooth but the error stays in the status label. So to say if I connected 7 clients to the 7 servers the error may go away? Or is there a different reason for this? Any help would be great. Check the Google Play store. I suspect there are free apps that will do this where you can connect your bluetooth earpiece to your phone, and then use your phone to talk to another Android phone over Wi-Fi. There are plenty of Android to Android over WiFi apps in the Google Play store. It was realy helpful!!! !..thank you! Please explain the following code and how Bluetooth works so that i can redraw on ondraw method. Further can be displayed on the screen. Yes! If you wanted to create a game that was played between two Android phones, you could do this using App Inventor and Bluetooth to communicate game actions between the phone. Sounds like a great idea! Hi, Thanks for the tutorial, really helpful. Can you please help me in a question? I just couldn’t figure out if I use multiple screens and I connected to the bluetooth, how can I send data from the other screens? Is it possible to send the necessary thigs to the other screens? You would need to add the Bluetooth control to each screen. I can see some problems with that, however. This is something I will try to experiment with eventually. 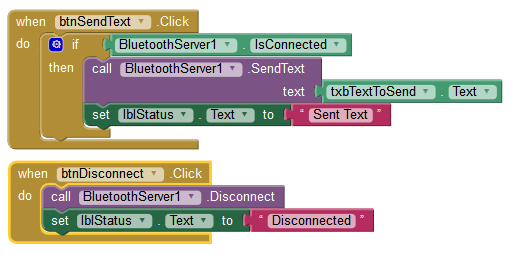 Right now I am working on Bluetooth LE, which is a new feature in App Inventor. Pingback: Introduction to App Inventor Bluetooth LE “Low Energy” – Part 0 | App Inventor 2 – Learn to Code! That is an excellent question! But unfortunately, I do not know the answer as I do not have other Bluetooth devices in order to check on this. I also have a tutorial on the website that connects the Android phone with an Arduino board through a Bluetooth link (its the single most popular tutorial on this web site!) Therefore, I know it is possible to connect Android / App Inventor apps over Bluetooth to non-Android devices. However, in that particular example, I also wrote the code for the Arduino board so that the App Inventor app and the Arduino are compatible. Another issue is that there might be a dependency on the version of Bluetooth that is in use. We are presently on version 4.1 or 4.2 but many devices are still using older Bluetooth versions (even back to 2.1). In theory, newer versions of Bluetooth are supposed to be backwards compatible with the older versions. But in practice, I have an older phone with BT 2.1 and it did not fully function with my BT 4.0 device. Finally, it is possible that the speaker uses Bluetooth Low Energy (part of the version 4 spec). The example code I have here works only with Bluetooth Classic features and does not support Bluetooth LE. I have some hardware and code that I’ve created which does work with app inventor to link to a Bluetooth LE device and I am slowly working on some more things for this, to eventually post on the web site. Hi i would like to know how do i print to a Bluetooth printer from my Android phone? For start, i dont need anything fancy. I just want to write an application from app inventor to send some text (sales receipt) to a bluetooth printer. How to i use the code that you have and add in code to print to a BT printer? Thanks in advance for your help and advice. I do not know if this can be done, but it probably would be somewhat difficult to do, if it is possible. When you send a file to a printer from your personal computer, your computer’s operating system contains a “print driver”. The print driver software translates requests for font sizes, colors, bold, italics and so on, into the specific commands needed to tell the printer how to display these items. To implement printing would require setting up a connection with the printer, and then properly preparing and formatting the data for the printer. Now, it might be possible to connect, and it might be possible to output characters in a standard code (such as ASCII) that display as ordinary text characters. It would be neat if this could be done but I do not have any specific information on how to communicate directly to printers. You could try using the basic Bluetooth communications code to see if you can discover a BT-equipped printer and then connect to it. If that works, you could try sending data bytes to the printer and see what happens! thanks for the fast reply. Sorry, i should make it clearer. Actually, the printer i have is a bluetooth thermal receipt printer (http://www.zjiang.com/cn/cpzx/pjdyj/bianxieshilanyadayinji/255.html). Based on the manual, it supports ESC/POS/STAR command. So, i would like to learn how do i send these command to print simple text to the receipt printer. At a start, no need fancy. just plain text. later, once I know how it works, only then i start to add in bold font, italic etc. Hope you able to give me some pointers….if possible, some example codes. Dalle indicazioni ho realizzato un App con bluetooth client per comandare arduino per apertura/chiusura tapparella tutto ok.
Pingback: Does your device support Bluetooth LE? Here is how to find out. – App Inventor 2 – Learn to Code! Can we share files or list of tables directly using the Bluetooth in MIT app inventory2 ..?? Hello. I was trying this app but I receive an error some other people had and didnt get a response. I am not sure on how to fix it, I had it in another app as well that’s why I turned to this one. Obviously, I checked that the device is on, I have a samsung s5. Can you please help me out? Usually that means that the Bluetooth device has been paired, but the other device is not reachable – either because it is off or because it is out of range. One of your devices is a Samsung S5 – what is the other device you are trying to connect to? I have been using Bluetooth between two Android devices, and between an Android device and six other Bluetooth connected Arduino boards, where I have separate Bluetooth components for each of the connections (in other words, 6 Bluetooth components added to the app). This is working okay for me. Let me know what the other device is in your set up? I’d like to understand this better. Pingback: Using MIT App Inventor | What is Dan Doing?